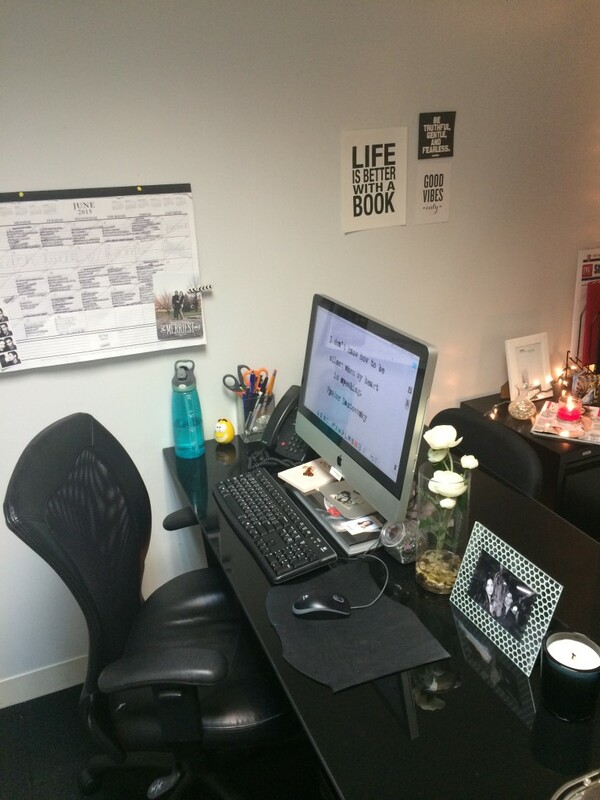 The following article is a part of our Deskscape Series. Many of us spend up to eight or nine hours at our desks per day, making our “deskscapes” a creative reflection of the book publicity work we do for our clients every day. I like to think of my office space as a creative and productivity haven – somewhere I can feel at home in and draw inspiration from, somewhere that’s fun to arrive at every morning. For that reason the vibe is consistent, in many ways, to my home environment – black and white, cozy but with a creative element, candles, flowers, photos of family and friends, and – of course – overflowing with books. I love to add a little light to my spaces, and I’m a firm believer that Christmas twinkly lights are appropriate indoors at any time time of year! I always keep a candle lit in that corner as well. 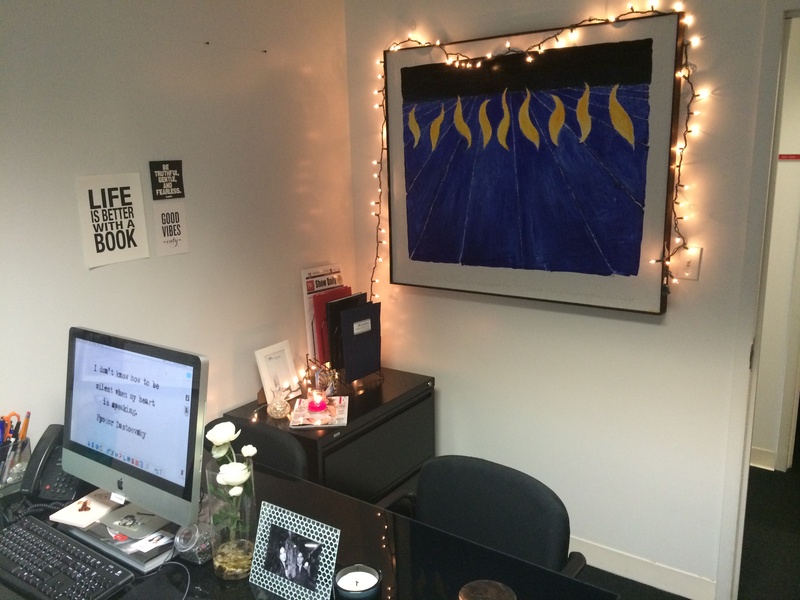 Both highlight the beautiful painting that Mr. Finn made, which has a calming deep blue that sets the tone for the rest of the office. The quotes above my computer say: “Life is better with a book,” “Good vibes only,” and a Gandhi quote that says, “Be truthful, gentle and fearless.” The latter is a card my mom sent me back in college, I’ve hung onto it ever since. It’s my digital PR strategy mantra of sorts. One of my favorite parts of my office is, of course, my bookcase. I love looking over and seeing all of the books of the authors I’m working with, and ones from past publicity campaigns as well. My black and white family photos are a must. I’ve always gravitated toward black and white over color photos. I like the classic contrast, something about it feels edgy but cozy. Also, my French Bulldog statue below them always makes me smile! My boyfriend and I are getting one of our own this winter, and I’m reminded of our furry bundle of joy to come every time I see it. 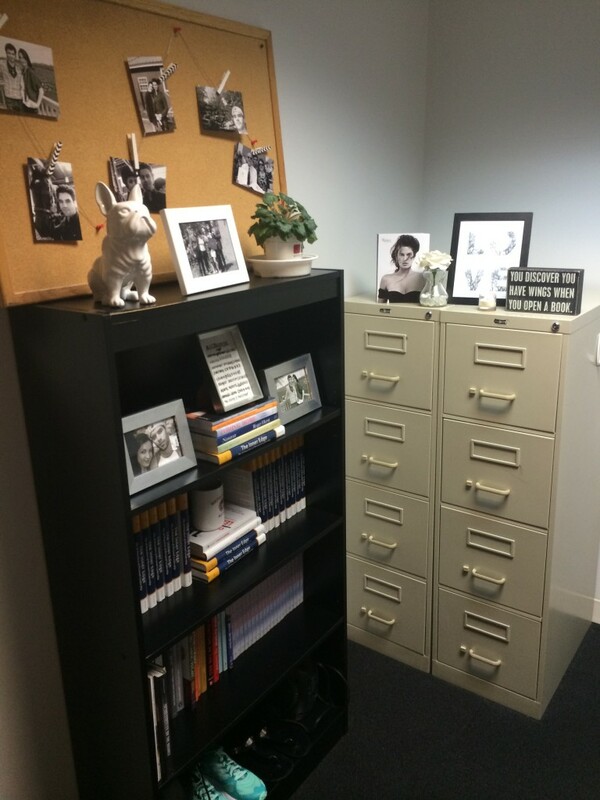 Another one of my favorite parts of my office is this little space above my filing cabinet. The book is actually a fall 2015 catalogue from Rizzoli. I keep all of my photos black and white, so I thought this added more depth to the space. The candle next to the quote is a winter scent, which fills a lot of my office. Even if it’s summer, I never get tired of it. 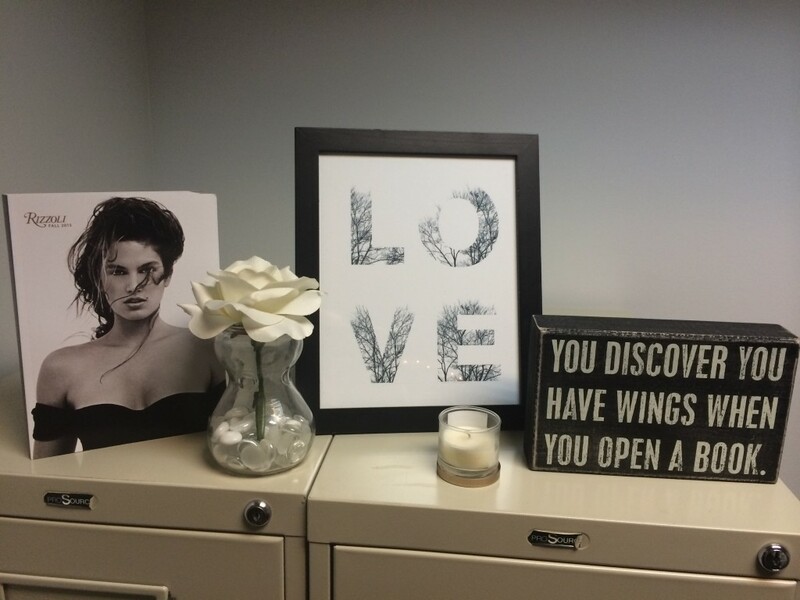 The quote, “You discover you have wings when you open a book,” is always one of the first things I see when I flip my lights on in the morning – it’s a great way to start off the morning! This entry was posted in Finn Partners and tagged anna patrick, anna patrick finn partners, anna patrick media connect, author social media, book publicity, digital book publicity, finn partners, media connect, Social Media. Bookmark the permalink. Thank you for helping me take my book to the next level.